We think that you shouldn't have to compromise on print quality to buy a reasonably priced Oki B4525 MFP printer cartridge. Thanks to our no quibble cash back guarantee on toner you don't need to take any risks. We'll give you a 100% refund in the unlikely event that your Oki B4525 MFP cartridge has not been able to meet perform as you'd expect. Place your now at Cartridge Save and save money! The Oki B4525 MFP laser multifunction printer is aimed at small offices that need a fast, user-friendly, and multifunction device to save space, improve document management, and increase their productivity. This all-in-one printer is also great for a growing micro office, but it only prints in black-and-white, and the high initial price might be too much for the budget. The compact body makes the Oki B4525 multifunction printer ideal for small offices. The device features an understated frame, but it manages to stand out because of the automatic document feeder on top of the 600x2400dpi scanner. The control panel looks busy with a cluster of buttons and a small mono display screen. The 250-sheet paper tray is loaded in front of the Oki B-4525 MFP printer along with the multi-purpose tray. The machine can be fitted with a high capacity black Oki B4525 MFP cartridge that prints approximately 12,000 black and white pages. There is a 33Kbps fax machine. It prints fast at up to 20ppm and users can leave the fax, copier, and scanner unattended because of the 50-sheet ADF. The Oki B4525 laser printer comes with the innovative PaperPort software so scanned pieces can easily be saved to the PC or converted into a PDF file, image, or document. Text is printed well, and it is possible to print directly from the front USB port. The Oki B4525 mono multifunction printer supports a good selection of media. Those who would like to buy this printer should look for other options because it has been discontinued by Oki. 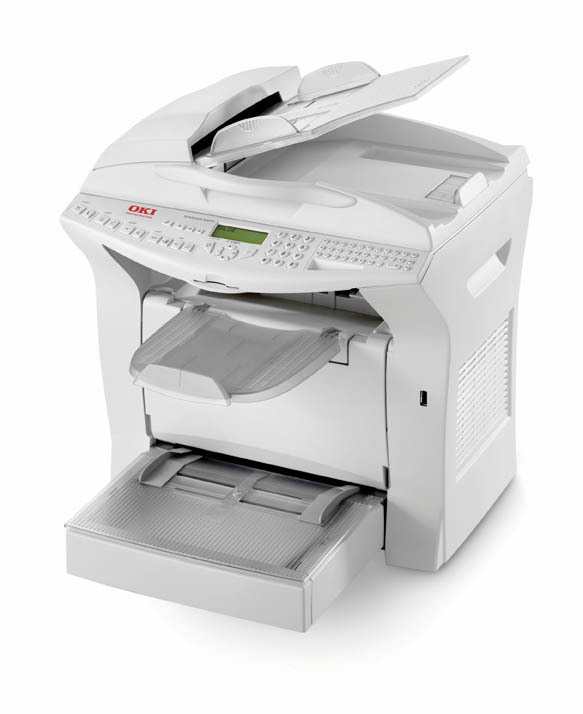 The Oki B-4525 MFP is also more expensive than similar multifunction devices from the competition. The limited 600x600dpi print resolution makes graphics and pictures look sub-par. Some users might be overwhelmed with the busy control panel of the Oki B4525 MFP.